Here in this post, we will give you the link to download and install the Essential PH February Security Patch 2019 update. The official stable OTA update is based on Android 9 Pie. 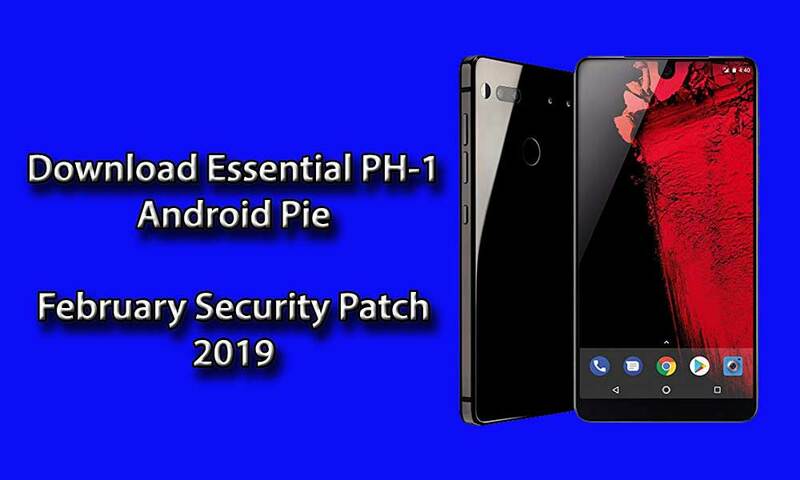 The Essential PH February Security Patch 2019 update build number is PQ1A.190105.014 and it brings a few system improvements as well. You can also download the Factory Image file and OTA file according to your requirement. The firmware file is only for the Essential PH-1 device. Don’t try this file on any other device. Follow the guide and step-by-step process correctly. Otherwise, you may brick your device. thedroidguru site won’t be responsible for any error or damage occurs to your phone while following the process. Do at your own risk. Make sure to be properly installed ADB and Fastboot driver on your PC/Laptop. Take a complete backup of your device data and system without doing anything. The flashing process can delete your device data. Keep your device battery charged at least up to 50%-60% to reduce the occasional shutdown during the process. Open your PC/Laptop and install the ADB and Fastboot driver. If you already installed then open the installed ADB folder on your PC drive. Now, press and hold the shift key from your keyboard and right-click to choose the Open command window here. This will reboot your device into fastboot mode. Now, type the below line to check whether your fastboot device connected or not. Now, type one more line to unlock the bootloader on your device. Done! You’re now successfully unlocked the bootloader. Now, follow the second step as well. Download the Factory image file from the above link and extract it on your device storage. Now, connect your device with PC again and go to fastboot mode via pressing and hold the volume down+power button together. This will reboot into fastboot mode again. Now, open the command prompt again and extracted the factory image folder on your device. Finally, tap on the flash-all.bat file to install the system image file easily. Copy the OTA file to the same folder where the adb is installed earlier on your computer. Now Switch Off your phone and boot into Recovery mode. Choose Apply Update from ADB. Now, connect your phone to your Laptop/PC. Go to ADB folder > open command here (press shift+right click). Check whether your device is connected or not. If it shows, you’re ready to flash the file. Now, wait until the process is done completely, then Reboot the device.